I can remember the first time I discovered my neighborhood rosticceria, or rotisserie -- I was at a friend's house, and she said that we should walk down there and get some chicken and lasagne for dinner. So we went over, just as the lasagne was being pulled out of the oven. Two young women worked behind the counter, expertly weilding the spits without burning themselves as I probably would, and carving whole roast chickens with two or three slips of a knife. Even before tasting anything, I was impressed. When I got home, I was delighted to find that the spit-roasted chickens were the best I'd ever tasted -- herby, salty, and moist, the skin was just amazing. We'd bought a bit of each type of chicken, both the tondo (round) and the schiacciato (flattened). In recent years, I'd come to prefer chicken leg to the breast, because nearly every breast I encountered was dry and flavorless. But deep down inside, it's the white meat that I love, and after a bite of the pollo tondo, I knew I'd found The Perfect Chicken Breast. As one might expect, the breast of the pollo schiacciato was drier, but the skin was crispier, and the leg was absolutely heavenly. The lasgane was an incredible heap of pasta fresca, ragú and besciamella, and over the months, I've come to realize that it's never quite the same. It's like a little lottery, except you never lose. Sometimes, there's more meat, sometimes more tomato, but it's always delicious, and always cheap. Especially in the summer, it seems like every other storefront in Florence sells gelato, so choosing the right place and the right flavor can be a little intimidating. Along with a comprehensive list of the city's best flavors and gelaterie, I'd like to give a little gelato primer, if you will, on how to choose an ice cream you won't regret (in case you forget the list I've prepared at home). 1. Start by looking for signs that say produzione propria, which means "house made," though even this is often not enough to guarantee that the gelato will be any good. 2. Every time I enter a new gelateria, I glance at the pistachio flavor. If it's neon green, then I leave. For me, this is a better indicator than produzione propria, because even homemade ice cream can be full of artificial flavors. Pistachios are relatively expensive, so many ice cream makers take the easy way out and use artificial flavors and colors to fake it. What makes gelato so lovely is the purity and explosiveness of its flavor -- if someone is stooping so low as to add food coloring to his or her pistachio gelato, then there's no telling what's being done to any of the other flavors. 3. My two favorite gelaterie, Vestri in Florence and San Crispino in Rome, use cylindrical steel containers to store their ice cream. The gelati are kept out of view, but are better refrigerated and preserved. For these places, the flavor of the gelato is advertisement enough -- they don't need to show their wares to attract customers, because they have the best product available. This sort of refrigeration system is more traditional, and also more expensive, than the hotel-pan-in-the-freezer-case setup that is much more common, but in my opinion, it is a sure sign that the gelato is of the highest quality. 4. When ordering gelato, try to limit yourself to three or four flavors. Having too many flavors can get messy, and it becomes difficult to tell which is which by the end of your cone or cup. All of the gelaterie that I've listed below make their own ice cream from scratch using fresh, wholesome ingredients. For the most part, you can't go wrong choosing any flavor at any of them. But, each place does have its strong points, and I've generously done extensive taste testing to be able to bring you the best of each gelateria. Throughout my time in Florence, I've lived in pretty much every neighborhood in the center: San Niccolò, l'Oltrarno, Sant' Ambrogio, and smack dab in the center between the train station and the Duomo. 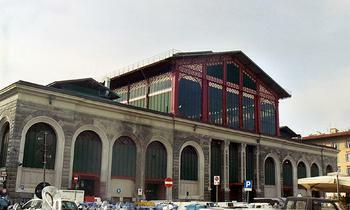 Though I loved San Niccolò and l'Oltrarno, living a minute's walk from the Mercato Centrale definitely appeals to the cook (glutton) in me. When I first got to Florence and worked lunches at Zibibbo, the only day I had off was Monday, so every single Monday I went to Nerbone for lunch. One of the chefs at the Chez Panisse Cafe was obsessed with the bollito (boiled beef) sandwiches there, waxing poetic about the thin slices of costole, or rib meat, and especially herby salsa verde every time he put bollito misto on his own menu. So I made a point of having a panino bollito be one of the first things I ate when I got to town, even if I was still grappling with the mid-September heat. Bollito isn't exactly the perfect summer meal. But oh, the joys of the perfect Nerbone panino. It took me some trial and error: in the beginning, when I didn't speak Italian, I got there once at nearly 2:00 p.m., just before the market closes, and asked for a sandwich. The cashier tried to warn me about something, but I acted like like whatever he was talking about was no big deal, and I just paid for the sandwich, anyway. 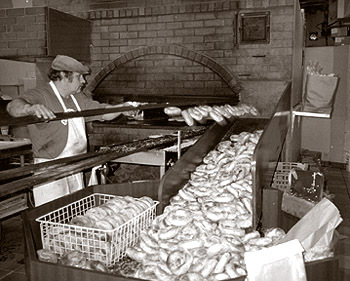 He gave me my receipt, and I walked to the other end of the vetrina to order my panino, and Stefano, the paninaio, pulled out a big hunk of lampredotto, the tripe that looks like the ruffled shirt of a 1974 powder blue tuxedo, and started to make me a sandwich. I realized later, after my first -- and not entirely unsuccessful -- encounter with tripe that they'd been telling me there was no beef left. 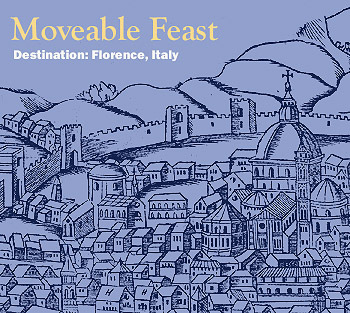 The Food Section travels to Florence, Italy, this week for the second edition of Moveable Feast, an ongoing feature consisting of local food writing with a decidedly non-New York focus. Professional cook and writer Samin Nosrat will be guest editing The Food Section for the next five days, providing a bellyful of culinary reportage on the flavors of Florence. Ms. Nosrat spent three years at Chez Panisse in Berkeley, California, before traveling to Florence to work on a cookbook with Benedetta Vitali, chef/owner of Trattoria Zibibbo and the author of Soffritto: Tradition and Innovation in Tuscan Cooking. She just returned to the United States, but during her final days abroad, she penned a series of reports on some of her favorite food finds and culinary experiences during her two years in Italy. From the secret culture of ordering a panino bollito at the Mercato Centrale to where to find the best gelato in Florence, Ms. Nosrat will be your gastronomical guide. While Ms. Nosrat takes the helm, Appetizers, the daily links, and Agenda, the weekly listing of food events, will be on a one-week hiatus, returning the week of July 5. While perhaps not technically googie in its architecture, the eye-catching style of Pop Diner recalls the classic 1950s and 1960s diners that dot the Los Angeles landscape. Located across the street from "Big Boy's Toys," an auto parts store, on a nondescript block of Queens Boulevard, Pop Diner has just opened in what was formerly the Sage Diner. The space has been completely renovated from floor to ceiling, complete with orange and black vinyl booths and shimmering aqua glass tables. It's a slice of L.A. in New York City. 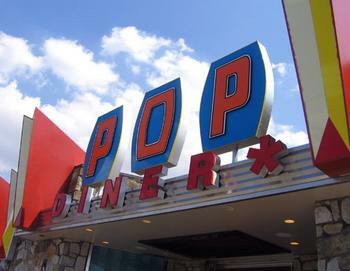 Pop Diner, 80-26 Queens Boulevard, Elmhurst, Queens (718.426.2229). 1. Summer Restaurant Week, featuring three-course lunches for $20.12 and three-course dinners for $30.12 at participating restaurants, continues through June 25 and resumes June 28 through July 2. Visit OpenTable for online reservations. 2. Blueberries: New Jersey's Wonder Fruit, a lecture by food historian Judith Krall Russo, offered by the New Jersey Council for the Humanities, Thursday, June 24, 7:00 p.m., at the Burlington County Library, 5 Pioneer Blvd, Westampton, New Jersey. Free, reservations required (609-267-9660 x 3072). 3. The Fancy Food Show, Sunday, June 27, to Tuesday, June 29, at the Jacob K. Javits Center. $60/on-site, $35/advance registration (212.482.6440). 1. Chocolate, Coffee, Tea, a special exhibition of the utensils developed to serve these products when they were introduced through trade in the 17th century, at the Metropolitan Museum of Art, 1000 Fifth Avenue at 82nd Street. The exhibition closes July 11, 2004 (212.535.7710). 2. Cookin': A Sizzling Entertainment, "a fast-paced kitchen percussion show combining comedy, rhythm, and non-verbal performance," at the Minetta Lane Theatre, 18 Minetta Lane (212.420.8000). 3. Beer Garden at the Brooklyn Historical Society, every Friday, 6:30 p.m. to 8:00 p.m., through August 27, at the Brooklyn Historical Society, 128 Pierrepont Street, Brooklyn. The Beer Garden is part of "100 Bottles of Beer on the Wall," an exhibition on the history of brewing in Brooklyn, on view through October 16 (718.222.4111). 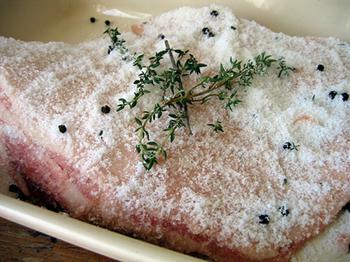 The Morning News has published an article I wrote on the trials of making guanciale (cured pig's jowl) at home. Lest you think I have succumbed to a strange diet consisting only of cured meat and fish, please note that the timing of yesterday's piece about gravlax and the publication of the above article is purely coincidental. With the theme of "Catch of the Day," Wena at mum-mum launched the fifth edition of "Is My Blog Burning?" -- this time requiring fish as an ingredient. Previous installments of the worldwide online cooking event have focused on soup, tartines, cake, and rice. For the previous "blog burnings," I've had a tendency to try my hand at creating something that I had never made before. 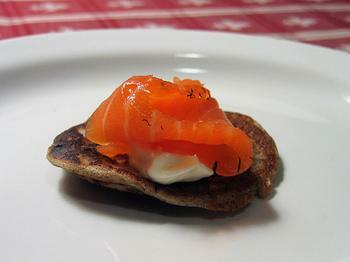 True to form, I decided to make gravlax, the Scandinavian cured salmon, for the very first time. 1. Taste of the Village, sampling of food and wine from 13 local restaurants, Thursday, June 17, 6:00 p.m. to 8:00 p.m., at Washington Square Park, Washington Square West and Fifth Avenue. $35/ticket (212.777.2173). 2. Wonder of Korean Green Tea, lecture, demonstration, and performance, Friday, June 18, 7:00 p.m., at the Korean Cultural Service, 460 Park Avenue at 56th Street (212.759.9550). 3. Summer Restaurant Week, featuring three-course lunches for $20.12 and three-course dinners for $30.12 at participating restaurants, begins Monday, June 21. Restaurant week continues through June 25 and resumes June 28 through July 2. Visit OpenTable for online reservations. 4. A Taste of Italy, sampling of Italian wines, Tuesday, June 22, 7:00 p.m. to 9:00 p.m., at The Mark, 25 East 77th Street. $75/ $65 Slow Food Members(866.KOBRAND).